Social networking's rarely social -- half the time you're at your comp wondering why some Iowan guy in a fedora friended you, and the other half you're hoping no actual friends show up at this bagel shop, because you run this bagel shop. Offering a solution, Hurricane Party. From a duo of UT math and design grads, Hurricane's a just-launched iPhone/web app that helpfully thieves from less streamlined services in order to bring legitimate friends together in real world settings. 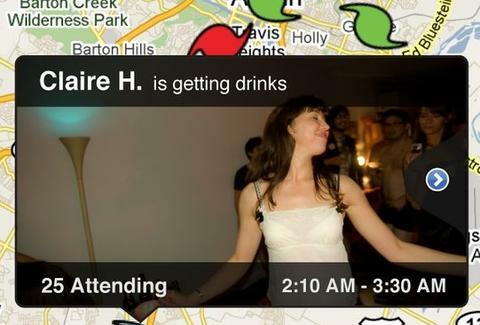 Start your "hurricane party" by selecting time & location, then choosing guests from people cross-referenced in both your Facebook and phone contacts; your chosen few get a text (to which they'll respond "I'll Be There", "Maybe Stop By" or "Rain Check"), and the party's geo-displayed with a spinning storm image that changes speed and color based on event popularity -- from CAT1 to CAT5, but not LOLCat, because that's so popular it'll level the city. HP also combs your social networks for public events created by other Hurricaners, displaying which of those gatherings your friends will attend, plus real-time wall-style updates -- so you'll know if your friends are actually attending, or just RSVPeasy. As Hurricane moves out of its tropical storm infancy, it's looking to add features (photo posting, etc) and work out promos with bars, restaurants, and coffee joints -- which you and your friends can converge on, then jointly ridicule that vaguely familiar fedora'd dude eating a bagel in the corner.